Provides all you need to know about the safe and humane handling and restraint of animals. Safe Handling and Restraint of Animals takes a holistic approach to the handling of a wide variety of animal species. This comprehensive resource offers a thorough overview of how to safely handle and restrain a number of commonly encountered species including dogs, cats, small mammals, exotic pets, horses and farm animals. Each chapter discusses the behaviour of the species and then outlines the appropriate handling and restraint methods, including any equipment required, multiple explanatory photographs, and useful further reading. 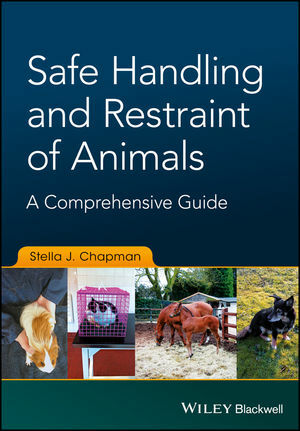 Written for students and professionals who work with animals, Safe Handling and Restraint of Animals: A Comprehensive Guide encompasses all aspects of handling and physical restraint, including biosecurity and welfare issues. Stella J. Chapman is a veterinarian with a keen interest in animal welfare and behaviour, and the role that the veterinarian has to play in animal husbandry. Stella has lectured at the Sydney School of Veterinary Science, University of Sydney, Australia and the School of Veterinary Medicine, University of Surrey, UK.